The program works well, but it was a lot of trial and error to get really good results. I am still tweaking things, but each one is a bit better then the last. These switches have 3 connections instead of the 2 on the mechanical ones. 1 goes to the Arduino Ground, 1 to the Arduino +5 volts and the third to the appropriate pin just like the mechanical switches. There are 2 LEDs to indicate the state, tripped or not, red and green. I have run the homing sequence about 200 times since yesterday when I installed them with no issues at all. I set a point using the G28.1 command, homed the machine and sent a G28, I was able to get repeatable homing every time. I tested them as limit swithces briefly, as I sent the gantry into the switch at 175IPM and it stopped movement perfectly. I will add switches to the other end of the X and Y Axis this weekend. Here is a quick video of the homing sequence. Were you using the mechanical switches as normally closed or normally open? Initially they were normally open, then I switched them to normally closed a few months ago. Ah, so still a problem in either configuration. Well thanks for the link. Those are some pretty cheap switches. I'll bet they could be easily potted in some hot glue to keep them from building up too much gunk or corroding. 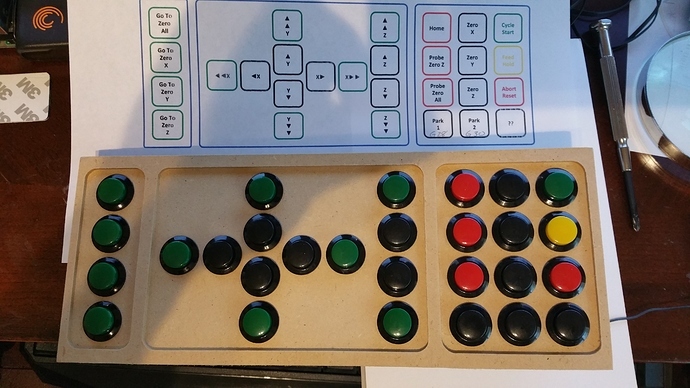 The buttons are wired into a 4 x 7 keyboard matrix, so I have 28 buttons. I will take it all apart, build a box for this to sit on and house the Due and the wiring and paint it. I decided to go wired as I don't tend to wander around too much while working. 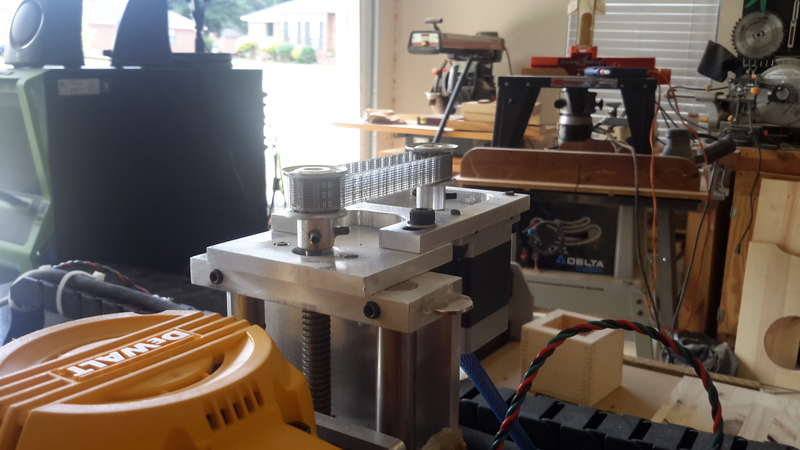 This will sit in front of the X-Carve on the stand. Everything is wired up and the program is written. All the buttons work great and control the machine through UGS. The only button that I haven't gotten to work is the Abort button, UGS has no way (that I can find) to send a CTRL-X to the machine. @MechanicalGoose - How is your abort button configured? @WillWinder - Is there a way to send CTRL - X through UGS to the controller? 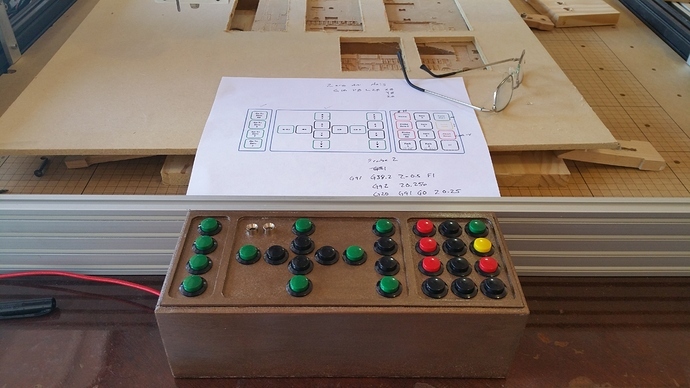 @ErikJenkins - I had 3 buttons tied in to a wireless 24v relay to push pause, abort and start commands from the remote to the board but after trying it out it is not very reliable. I could get a better relay but I'm trying to keep the cost down because I plan to offer these up for sale. So I've decided to move those 3 buttons to the control box next to the e-stop and hardwire them in. I would like to do it from the command line with gcode in UGS with the remote unfortunately I was reading that it is not currently supported. Cycle start and feedhold works through UGS. I have 3 buttons hardwired into the controller as well and they work fine, just wanted them on the pendant as well. Ah, maybe it was just the abort I saw. If those are supported they I will most likely add them as buttons on the remote then also. @ErikJenkins in the UGS Platform version you can configure the "Soft Reset" shortcut to send 0x18 (aka CTRL-X). If you try the nightly build the cancel button now does the soft reset automatically. How are you interacting with UGS? I am emulating a USB keyboard and sending the commands directly to the Command box in the nightly build of the of the Classic GUI. I can send a ctrl-X, but the command box in UGS does not accept it. In any format I have tried. My pendant is assembled now. The pendant is acting as a standard USB HID device and sending commands to Universal G-Code Sender through the command entry field. The pendant works with both UGS Classic and UGS Platform (nightly builds). Box complete, glued up, painted and clear coat. I used an Arduino Due for the brains of the box. All buttons function perfectly except for the Abort button (I will keep working on that one). I added two LEDs, one will be an indicator for a shift button. I will use the lower right button as a shift key to allow a total of 4 jog increments. Currently the jog buttons move 0.01" and 0.1". I will add 0.5" and 1" once I add the shift key. The second LED is waiting for a purpose. If I find I am not using certain buttons, I can change their function at any time. And 12 Jog Buttons 4 for each axis. That is a nice piece of kit! Nicely done. Wow, this is very impressive. Nicely done. Maybe try to engrave the buttons? A laser would be best but I'll bet it could be done with the proper model of the curved surface and a taped down button.